On Friday, I shared a Pea and Potato Curry recipe from Martha Stewart Living's latest cookbook, "Meatless." Today, I am sharing my favourite recipe from the book (so far). 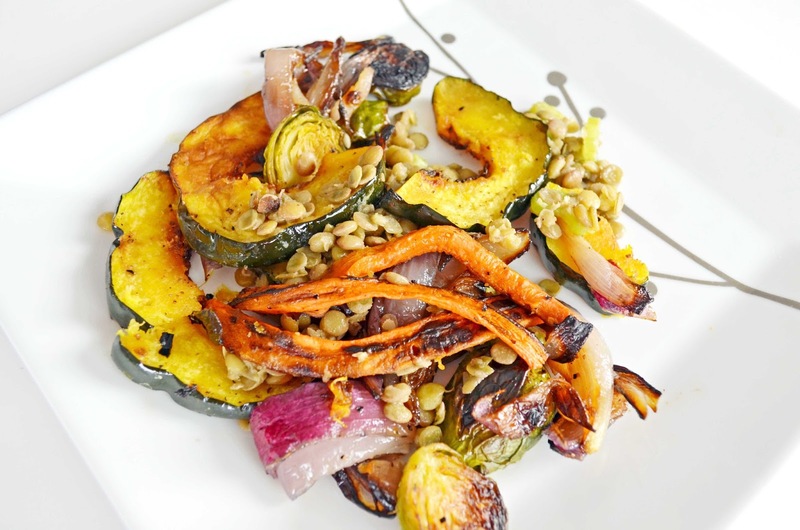 As I told you in my original post about "Meatless," my husband made this recipe for Roasted Fall Vegetables and Lentil Salad for dinner one night. The ingredients are simple and healthy - like acorn squash and brussels sprouts. The results are surprisingly delicious. If you love veggies and lentils like I do, I highly recommend giving this one a try. Here's our version of the dish, below. My husband cut the carrots thinner than the book recommends to ensure they would be tender enough. This recipe is gluten-free and vegan, so it works well for most diets. It's fancy enough for company too. Visit my original post for more great recipes (for vegetarian chili and avocado salad) and your chance to win a copy of the book. 1. Preheat oven to 425°F. Combine carrots, onion, squash, and Brussels sprouts on 2 rimmed baking sheets. Drizzle with 2 tablespoons olive oil, and season with salt and pepper. Roast in an even layer, turning once, until caramelized and tender, about 30 minutes. 2. Meanwhile, place lentils and shallot in a medium saucepan and cover with water by 2 inches. Bring to a boil, then simmer, covered, until lentils are tender, about 20 minutes. Drain; discard shallot. Season with salt and pepper. 3. In a medium bowl, combine vinegar and mustard. Pour in remaining 3 tablespoons oil in a slow, steady stream, whisking constantly. Add warm lentils and sliced celery and toss with vinaigrette. Season with salt and pepper. 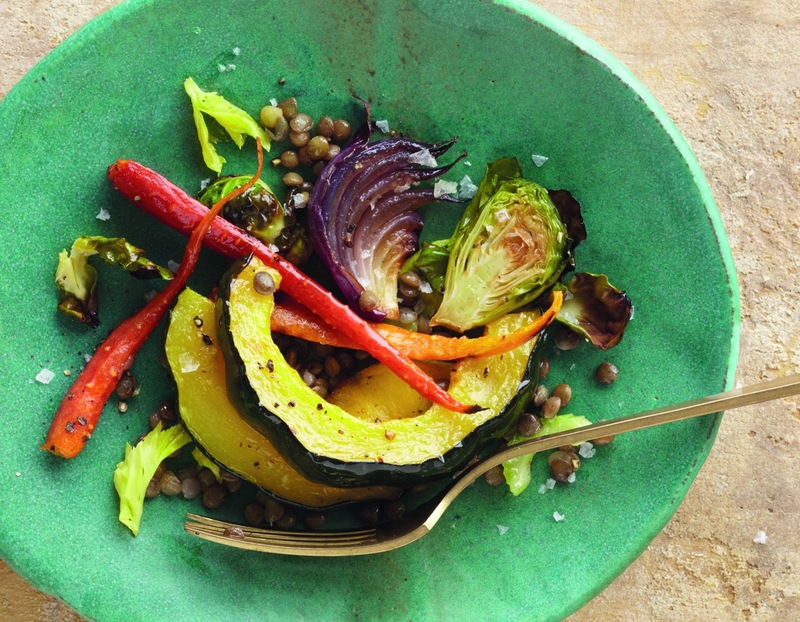 Spoon lentil salad onto 4 plates and top with roasted vegetables. Garnish with celery leaves and serve. Looks so delicious. Thank you for all of your wonderful recipes. I'm hungry now. Great post! Oh goodness, this looks so delicious! I have some of these ingredients... may have to improvise! Not only is this veggie dish beautiful but it sounds delicious! I klove this, it looks so delicious, healthy, and colorful. Yum! the colors in this dish make it so beautiful! thanks for stopping by my blog, now following you in return :D have a great day!